It's hard to believe that people have been living in the Arctic for 40,000 years. How can people survive in such a harsh environment? And what would prompt them to stay? Anthropologists who study Arctic cultures have discovered that it's quite a hospitable place for those who figure out how to get by. Hundreds of cultures have occupied the Arctic over time. These communities have adapted to life on the ice. They invented a variety of ways to get around and find the resources they need. Skis, dogsleds, reindeer, kayaks, and snowmobiles have helped Arctic people connect with each other and the natural resources. Natural resources that sustain Arctic life include huge numbers of marine mammals. They include bowhead whales and ringed seals and massive herds of land animals such as caribou. An Arctic mammal offers a full set of essential supplies. From clothing to food to cooking oils, plus bones to make tools or boat frames. Both people and the wildlife they depend on are closely connected to Arctic conditions. Small changes in temperature lead to large changes in sea ice. The temperatures spur migrations and adaptations of animals and people. For thousands of years, Arctic people have been adjusting to seasonal variations and longer-term climate changes. 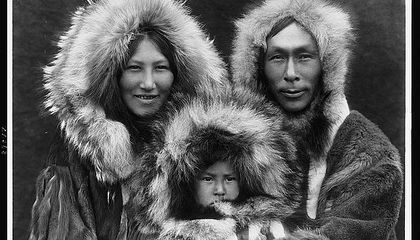 It is their culture and they are able to live out their with expreirence to live out their.Also they love it and they know their way around the arctic. This is a good thing because it cool to see poeple living in the very harsh conditions because it shows us nothing is not impossible. I still don't understand how people live there. I would be crying because of the cold. This is really cool and I think that if you are born and raised there that it wouldnt be as cold as it would be for us. The motivation to stay in cold places such as the arctic are probably the large supply of food. The mammals there are huge and the people need huge animals to sustain themselves. Also, one single animal can contribute food, tools, and clothing. You could live in the Arctic if you adapt to the environment. I think if I adapt to the environment and if I had food I could live there. I think it will cool in summer because it is hot in summer, so I would swim in the ocean if it is really cold like the swimming pool. Won't you freeze to death if you stay there for a long time? In the movies I saw people's toes or finger turning purple and they had to cut their fingers or toes. I think I won't live in the Arctic after all. I think L.A. is the perfect place for me to live, or somewhere peaceful. I can't live in a cold place or in a hot place, then where should I live? In a cold place or a hot place? I think I will stay in the cold place because you can't do anything when you are hot you just frustrated. I think that both culture and climate had changed the arctic which right now the arctic is already melting away because of the global warming. The Culture might have changed the arctic because the way the animals were killed by the cultures that occupied the arctic. People living in the Arctic have to face harsh weather and sometimes a lack of food, but what motivates them to stay is those who came before them, "Both people and the wildlife they depend on are closely connected to Arctic conditions". I find it interesting that people can be so connected with the environment around them that they will stay no matter what the situations are. I think this is cool because it is important to know that there are still people living in the ice. As climate change occurs, people aren't thinking about those living in the ice. When the ice melts, there will be less food, less ice to make igloos, and they cannot drink water. It will have a huge impact against them. Answer: Abundance of natural resources and because they have adapted to the weather. The connection needed between the wildlife in the Arctic and the people might be what motivates them to say. As mentioned in the article in paragraph 4, the wildlife and the people are very connected to the natural resources and the arctic conditions. I found this article interesting because I was fascinated with how long people have been living in the Arctic. The story is okay because i always wondered how they survived in the arctic,but i didn't get enough information.